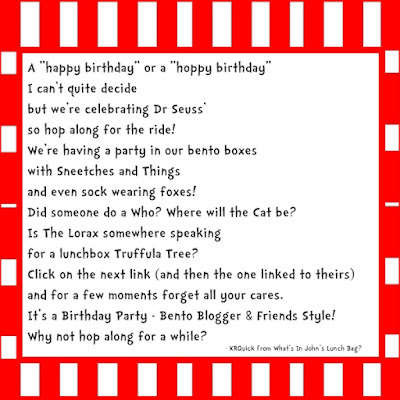 BentoLunch.net - What's for lunch at our house: Happy Birthday Dr. Seuss! 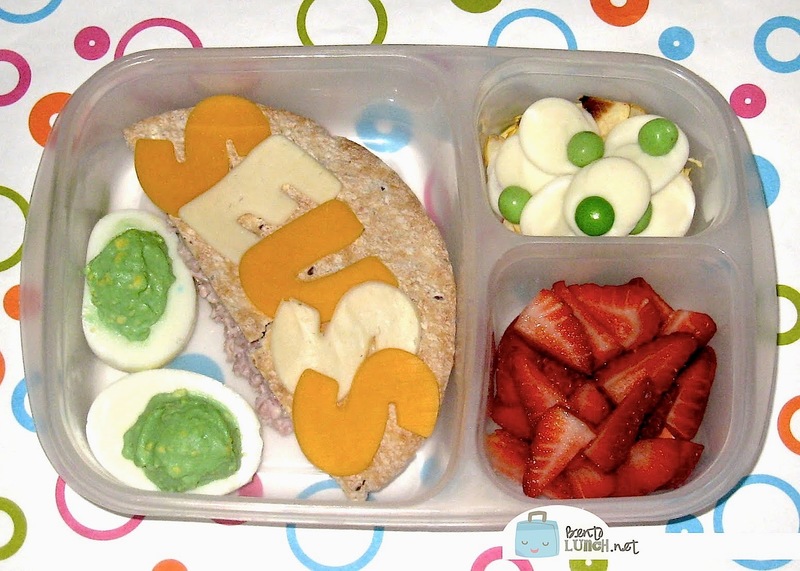 Today is Dr. Seuss's birthday and we had to have a celebratory bento. Narrowing down a choice was hard, but F&B saw the Green Eggs and Ham ideas and immediately decided that was what they had to have. I'm also partial to Ten Apples Up on Top, as this was the first book Ben read independently without having seen it before (it was at my mom's house a couple of summers ago). I was going to make apple chips to go along with that, but halfway through the first batch, the microwave blew and well, we had to switch to another idea. Ben has green eggs, of course, and ham, in the shape of a ham salad pocket, with SEUSS cutouts on top. To the upper right, we have some candied green eggs (another story in and of itself, I forgot to buy M&Ms) on top of the still yummy, but not great looking, apple chips. To the lower right, there are strawberries, which have no Seussical significance, just the need to be eaten today. Lunch is packed in our Easy Lunchboxes. After the fun we had with the Valentine's Blog Hop, some bento friends and I decided on a Seuss themed one today as well. Check out Astrid at Lunches Fit for a Kid and her awesome Yertle the Turtle bread! What a cute lunch!!! So what did you end up using for the candy eggs with no green M&Ms??? Delicious and love the mini candy eggs! yum! I want green deviled eggs! I love your candied green eggs and the ham pocket with the big letters! Please share how you made those candied green eggs. They look fantastic! <3 it! My favorite are the candied green eggs. Awesome! I love coming here for lunch ideas. Green eggs and ham are fun, but have you seen the studies regarding food dyes?